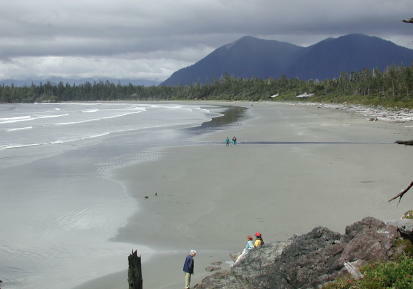 Whether it’s a romantic getaway weekend or a family vacation, there’s a broad swathe of blond sandy beach awaiting you just south of Tofino, Vancouver Island. Mile-long Cox Beach meets our criteria for a perfect beach: the sand is firm enough for serious walkers to enjoy an unimpeded stroll yet soft enough for a toddler’s play. And its proximity to Clayoquot Sound, the United Nations Biosphere Reserve, means visiting this region of coastal temperate rainforest offers even more of an air of adventure and discovery. If all this wasn’t enough, we were eager to revisit famous Long Beach, which we explored on our honeymoon twenty-two years ago. However, this time we were on a completely different kind of holiday, one which we think boomers will seek out more and more frequently. “Adult kids” like us are increasingly on the lookout for safe yet satisfying family holiday destinations to go to along with their own parents — who sometimes have challenging mobility issues to deal with. Cox Beach proved to be just the ticket for Eric’s folks who are both 79. While they are both fit, Parkinson’s brings its challenges to gadding about as they once did. Where could we take them that was reasonably close to Victoria, where they retired a couple of years back? Moreover, because they are still capable walkers, we didn’t want to frustrate — or insult — them by taking them to a place that was in any way bland. Lucky us! We discovered that the Pacific Sands Beach Resort, a property that sprawls over 45 acres of oceanfront land, fitted all our requirements. A fabulous stretch of beach, friendly but “in the background” staff, cozy cabins, and superb oceanfront walks. We arrived after a four hour drive from Victoria and were greeted by affable and knowledgeable general manager, Dave Pettinger. He’s worked here for 28 years… a fact which allows him to assess his client’s needs perfectly. To suit our needs, he selected a cabin nanoseconds from Cox Beach. Had we found heaven? It seemed so: the cozy two-bedroom cottage contained two private bedrooms, a shared bathroom, and in the front overlooking the ocean, an open-concept living room, dining room and kitchen. Floor to ceiling windows offered a stunning view as well as plenty of light for reading and playing board games after dinner. As soon as we saw it, we knew this resort was going to be just right for us all. Modern kitchen facilities allowed us to prepare meals in a microwave or oven, while the fridge was large enough to be of real use. Nearby Tofino’s handy grocery shops provided everything you could want (including wine and scotch) though groceries were pricier than in Victoria. After checking out our cabin for a few minutes, we promptly exited, aiming to maximize our three days of on-island oceanfront exploration. The beach beckoned and off we went, down its inviting sweep: a pungent salt breeze took our breath away. Here and there, couples encouraged their tiny tots to take first tentative steps along the sand. Older toddlers could be seen dashing about, squealing with delight as they dabbled in the waves. Honeymooners strolled, joined at the hip, while small knots of other older guests gazed out to sea from companionably arranged deck chairs. All in all, the scene spoke of utter and complete relaxation, amid the soothing sounds of the ocean’s waves. Because we timed our visit in early June, older children were still in school which proved perfect for us. In fact, everywhere we went on-island, properties were opening up for the summer season: staff were relaxed and able to spend ample time helping us plan our daily activities. The resort offers many activities, whether it’s exploring the rocky coves and hiking paths, or joining an organized event. 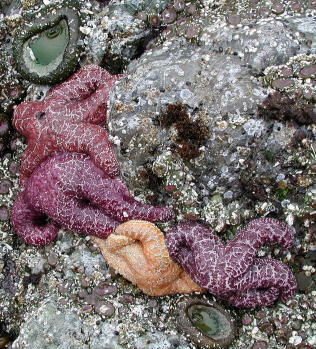 These might include Saturday guided walks (from June through September) with the resort’s on-site naturalist who will explain the difference between a barnacle and a limpet… or identify marine life you are gazing at in the tidal pools. But it is also worthwhile to take one of the resort’s bikes and peddle off-property. We ventured to the Tofino Botanical Gardens, an evolving project designed with creative whimsy. A network of paths introduce you to 1,000 year old cedar trees, to a medicinal plant garden, and several works in progress. The twelve acre site is just over a kilometre south of Tofino, and when we visited the entry fee was $8.00 per adult, which was good for three days. A garden tearoom serves organic, delicious meals. Tofino itself is a picturesque fishing village full of shops, art galleries, restaurants and outfitters. Some of it is undoubtedly “touristy,” but while walking about, you’ll uncover your own special discoveries. For instance, you might choose to rent a boat and venture up the craggy shoreline to Cougar Annie’s Garden: we missed it, but the story is that in 1915 Ada Annie carved out a homestead in the coastal wilderness. The garden grew… as did her fame. She had four husbands, eleven children, and won her name after shooting innumerable cougars that came too close to her neck of the woods. We’ll return someday to check out the 5+ kilometres of trails, plus take in a guided tour of the homestead ruins. Of course, from Tofino there are a host of sea-based activities including whale-watching excursions, sea kayaking in Clayoquot Sound, or black bear watching expeditions. Spring (March-April) is the time for observing the gray whale migration where 20,000 of these mammals pass by. Still another enticing sounding trip would be to the natural springs at Hot Springs Cove. 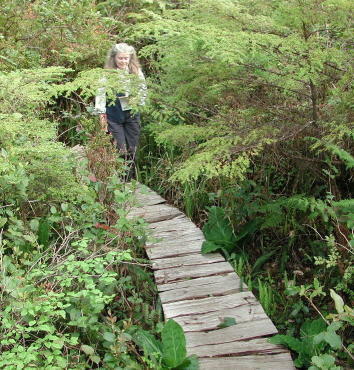 We four opted for exercise, and drove to one of the trailheads at nearby Pacific Rim National Park. From there we negotiated an alternating boardwalk and forest-path trail that took us to Long Beach: we dawdled happily, remarking on the rainforest’s gigantic cedar and hemlock. What made this trip particularly special for us was knowing that at the close of our day’s adventures, we would enjoy our little paradise of a cabin, nestled beside Cox Beach. And, we did. So will you. Pacific Sands Beach Resort has been owned and operated by the Pettinger family since 1973. Beautiful British Columbia Magazine named the resort their second favourite place to stay in 1999, while nearby Pacific Rim National Park was voted first among favourite places to visit. We concur: if you’re looking for a great holiday resort, look no further. Visitors can choose between cedar beach cottages; studios with fireplaces, patios or decks (ideal for couples); or recently upgraded one-and two-bedroom suites — some for up to six people boasting fireplaces, decks or patios and ocean views. Couples on a romantic getaway may prefer one of the luxury suites with a hot tub on a deck overlooking the ocean. The resort is open year-round with room rates beginning at $190 per night during the summer. Special raters are available for Whale Watching and for the Wild for Winter package, offering three-, five-, or seven-day escapes from November through February. Safety First: note that swimming is not recommended at the resort, as in most places along the wild west coast, due to rip tides. This does not mean youngsters through to seniors can’t enjoy paddling in the shallows: but it does mean you must take care.